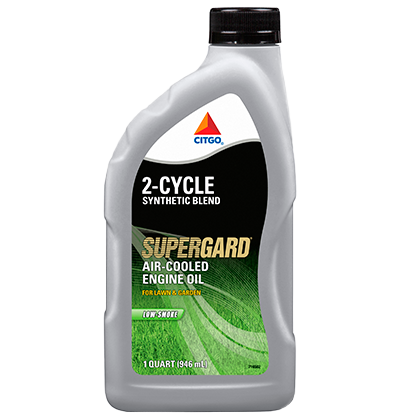 CITGO SUPERGARD Air-Cooled 2-Cycle Engine Oil is a premium performance synthetic blend lubricant designed for use in high performance air-cooled two-stroke engines. Engineered for lower smoke and advanced protection for air-cooled 2-cycle engines. This synthetic blend formula meets or exceeds the rigorous requirements of the API TC, JASO FD and ISO-L-EGD classifications for 2-cycle air-cooled engine oils and also exceeds the performance requirements for JASO FC, FB; ISO-L-EGC and -EGB. This advanced oil helps to protects today's high RPM air-cooled 2-cycle engines against exhaust port blocking, combustion chamber and piston deposits, ring sticking and scuffing, and wear. The JASO FD Certification number for this lubricant is 001 CGO 545.